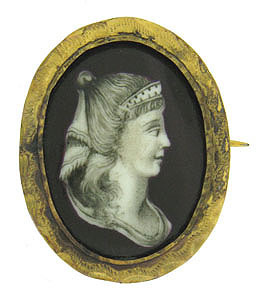 This spectacular antique portrait pin features a highly detailed woman in profile. Lovely detailed Engraissaile enameling details this beautiful courtier. An oval gold filled frame adorned with pounded abstract detail surrounds the spectacular portrait. 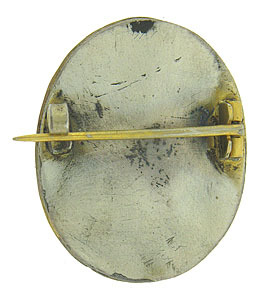 The antique pin is finished with a simple pin back and measures 1" x 3/4". 17th century.